“SEFOS” IS NOW OPEN FOR 2017 SCIENCE FAIR SEASON! 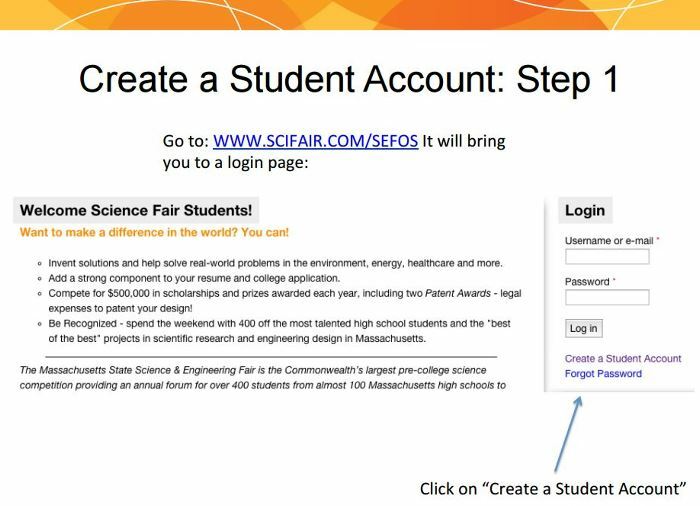 MSSEF’s Science & Engineering Fair Online System (SEFOS) is now open for all high school students who plan to participate in any Massachusetts Science & Engineering Fair for the 2016-2017 school year. All students must first apply for approval of their research plans prior to beginning any experimentation. SEFOS will guide students step-by-step through the process, and the required research forms will automatically be generated based on data provided by the students. 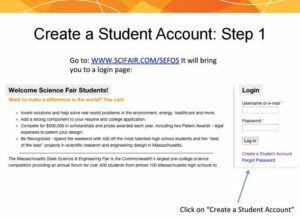 SEFOS eliminates the “guessing game!” Students simply go to this link Science & Engineering Fair Online System (SEFOS). Before your students start working to complete required forms, we strongly suggest you direct them to review the high school manual. This manual is an important first step for students and will give them information about how to enter the Massachusetts State Science & Engineering Fairs, about conducting experiments, research & safety regulations, and restricted areas of research or research areas that will require MSSEF Scientific Review Committee (SRC) prior approvals. It is better to be sure the project is all set before the student starts to work on it, rather than find out it has been disqualified for safety reasons after all the work is done. Two Easy Online Steps for Your Students! New Students First-time students must create a Student Account and personal Profile. Then Create/Join a Project. Returning Students Students who already created a Student Account in a previous year, must log into their account to update their Profile. When completed, student must return to his/her home page, and in the right margin click on Create/Join a Project. Team ProjectsAll members of team projects must also either create or update their Student Profile as a first step. The Team Leader must then create their 2017 Project, and then provide a code from SEFOS for the team members to log into their own accounts and join the project. (Each team member must first have a Student Account and Profile before they can join the team project. )In all cases, SEFOS will allow students to reset passwords. Based on the information that students provide in their 2017 Project description, SEFOS generates the required PDF forms for students to download and print, and then obtain required signatures from teachers and mentors. SEFOS will auto-fill relevant information into the PDF form(s)! Students need to check the pre-filled information, complete the downloaded forms, obtain required signatures, and then log back into their accounts to upload their completed forms. Be sure to keep in your possession a scan or a jpg file of each form you have filled out. All uploaded forms are reviewed by the Regional Science Fairs’ SRC. Find the Regional Science Fair for your school. Through SEFOS, by email, students will be notified whether their project will require pre-approval. For projects that do not require pre-approval (as determined by the SRC) of their research plan, the student may begin his/her project immediately. For students whose projects do require pre-approval, they must first receive notification from the Regional SRC Review Committee that they may begin experimentation; otherwise they will be disqualified from the science fair competition. Click here for a step-by-step PDF of how to complete the high school forms in SEFOS. If you have any questions, need more information, or require assistance, please contact sefos@scifair.com. We look forward to an exciting and rewarding 2017 Science Fair Season. Check back again soon, for future blogs with more suggestions about science fair preparation.